St. Patrick's Day is celebrated in honor of St. Patrick, the patron saint of Ireland. Patrick's birth name was Maewyn Succat and was born in Britain to wealthy parents in the late 300's. He died on March 17, 461 A.D. When Maewyn was 16 years old, he was taken prisoner by a group of Irish raiders who were after his family's property. They took to Ireland where he spent six years in captivity. While a prisoner, he worked as a shepherd alone in the countryside. He turned to Christianity for solace and became a devout Christian. He dreamed of being an evangelist while guiding the sheep. Maewyn escaped and walked almost 200 miles to the Irish coast and then returned to Britain. An angel appeared to him in a dream and told him to return to Ireland as a missionary. He than began religious training and was ordained as a Catholic priest in Gaul. It was at this time he took on the name, Patrick. While in the monastery, he developed a desire to convert the pagans of Ireland to Catholicism. At around the age of 60, he then returned to Ireland to minister to Christians already living in Ireland and began to convert many Irish over to Catholicism. He used the shamrock in picture stories to describe the Father, Son, and Holy Spirit. 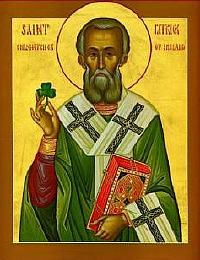 St. Patrick believed in incorporating existing traditions into his lessons on Catholicism. He used bonfires to celebrate Easter because they used bonfires to honor their pagan gods at the time. 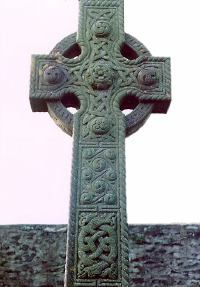 He placed the symbol of the sun onto a cross to create the Celtic cross (see photo above left) so that the cross wouldn't seem so foreign to them. His ministry lasted 30 years until he retired to County Down. Following St. Patrick's death, the Irish celebrated the anniversary of his death beginning in the fifth century with a feast. Because the date falls on the Catholic season of Lent, Irish families usually attended church in the morning and celebrated in the afternoon. Because Lent forbids the consumption of meat, the Catholic church in Ireland waived the rule so that people could drink, dance, and feast on Irish bacon and cabbage. Believe it or not, but the first St. Patrick's Day parade took place in New York City on March 17, 1762. Irish soldiers serving in the English military marched in the parade. The parade helped the soldiers to reconnect with their Irish roots. As Irish immigrants increased, Irish associations began forming. Societies like the Hibernian Society and the Friendly Sons of Saint Patrick would all hold parades in various cities. These parades featured bagpipes and drums. Most Irish immigrants at this time were Protestants until the Great Potato Famine hit Ireland in 1845. One million poor, uneducated Catholic Irishmen began to pour into America to escape starvation. Both Protestant and Catholic Irishmen began to organize to give them more political power. They formed a voting block called the "green machine." Irish music groups and sports teams today call themselves the "green machine." Ireland is associated with the color green because it is identical to the greens of Ireland that gave it the name, "The Emerald Isle." These associations united both Protestant and Catholic Irish and St. Patrick's Day parades suddenly became big events. In 1948, President Truman was the first president who attended New York's St. Patty's Day parade. Today, St. Patrick's Day is celebrated by people of all backgrounds in countries with Irish populations. Today, in Ireland St. Patrick's Day is a religious celebration. Up until the 1970's Irish laws forbid the sale of alcohol on this day. In 1995, Ireland began using the holiday to promote the country to tourists. One million people took part in Dublin's St. Patrick's Festival. The festival included concerts, theater, parades, and fireworks. These parades are big events in major cities around the world. The number three is significant in Irish tradition. The number three is the number of leaves on a shamrock; the Crone goddess (a pagan god whose name was Hecate), Mother and virgin; Father, Son, and Holy Spirit; and Faith, Hope and Charity. The number three is an important Celtic number that is considered sacred and magical. To be lucky on St. Patrick's Day, tradition says to wear green (you may get pinched if you don't), kiss the Blarney Stone, and catch a leprechaun. 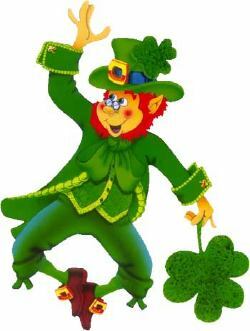 The name leprechaun (also called lurachmain, leipreachán, lurican, and lurgadhan) is a character from Irish folklore who came from an Irish word for shoemaker, "leath brogan." The leprechaun is traditionally a short man and has its origins in another Irish word, "luacharma'n," which is Irish for pygmy. The folklore is thought to have been started by the Tuatha Dé Danann, a group of people who inhabited Ireland before the Celts. Because home-brews are an important part of life in Ireland, the old, short men are frequently shown in an intoxicated state. Originally they were shown frequently to carry around and hold a shoemaker's hammer. Leprechauns are said to be guardians of ancient treasure left by the Danes when they robbed and pillaged people around Ireland). They bury their treasure in crocks or pots. Their treasure is said to be found at the end of a rainbow. Because they are are distrustful of everyone, they try to avoid human contact. They are absolutely petrified of being captured by a human and if captured, will try to bribe the human with their treasure on the condition they are set free. Some legends say that the leprechaun has the power of hypnotism and can confuse their targets. Before the 20th century, leprechauns wore red clothing. They wore red square-cut coats laced in gold and with seven rows of buttons, and red crooked pointy hats, shoes, and buckles. Leprechauns carry two leather pouches. One is for a silver shilling, a magical coin that returns to the purse each time it is paid out. In the other pouch he carries a gold coin which he uses to bribe his way out of captivity. This coin later turns to dirt or leaves. Because of this, a human is wise to demand the treasure rather than be tricked with the gold coin. In order to gain any treasure, a human must keep his eye on a leprechaun at all times because they will vanish quickly if the gaze is turned. The image we see of the green leprechaun today is largely a figment of the imagination of television and movie studios. In the Leprechaun horror film series, the character is even evil and murderous. The image of the leprechaun has become nothing like the character in Irish mythology. Some in Ireland are even resentful at the stereotype of their nation. A cousin of the leprechaun is the cluricaun. Cluricauns steal or borrow almost anything and create chaos in homes during the hours of darkness. Their favorite hobby is to raid wine cellars and larders. They also keep sheep, goats, dogs and chickens and ride some of them through the countryside at night. Some of the lessons below incorporate art with other subject areas. These lessons are for all subject areas. Leprechaun Pot of Gold [Archive] by Crafters Community. Also see their rainbow mobile lesson [Archive]. Teacher Planet's St. Patrick's Day Page - with worksheets, clipart and more. The Teacher's Guide to St. Patrick's Day - with links to lessons and activities. Free Clipart for Kids with lots of clip art.